RECIPES FROM MY TRIED & LIKED FILE WITH TWEAKS THAT MAKE THEM FAMILY FAVORITES. 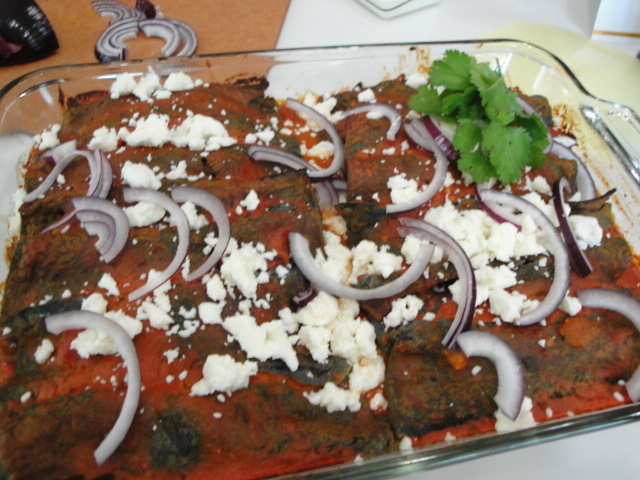 When I say “I’m thinking of making a batch of enchiladas.” the first thing my husband says is “Mexico City Enchiladas?” What last weeks Chicken Enchilada Verdes lack in authenticity, Mexico City Enchiladas make up for in spades. 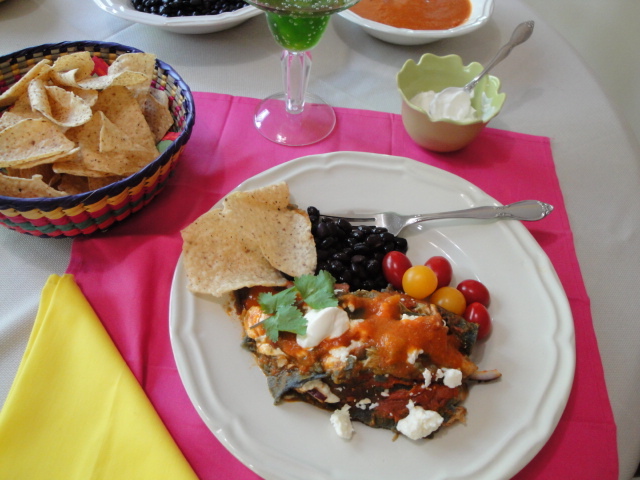 The source is another of my go to cookbooks – Mexican Cooking by Cynthia Sheer. It’s one I gave to my then “boy friend-to become husband” for Valentines Day because it had a recipe for Huevos Machaca. I’m not sure we ever actually tried to make it because nothing could ever live up to the dish as served at Manuel’s Original El Tepeyac in Boyle Heights, Los Angeles. If you are ever in LA, it is a place you should try to visit. Their claim to fame was the MANUEL’S SPECIAL BURRITO made with Original Chile Verde Pork It weighed in at 5 lb. and would easily feed a family. But it was the #9 Machacha dinner that was my favorite. I loved leaving the line for entry (and there was always a long one) to watch the chef’s sauteeing the shredded beef with onions, tomatoes, jalapeños, eggs & melted cheddar cheese. It was their beef that made the dish so unique-aged and air-dried and produced in the northern part of Mexico. My mouth waters just with the memory. 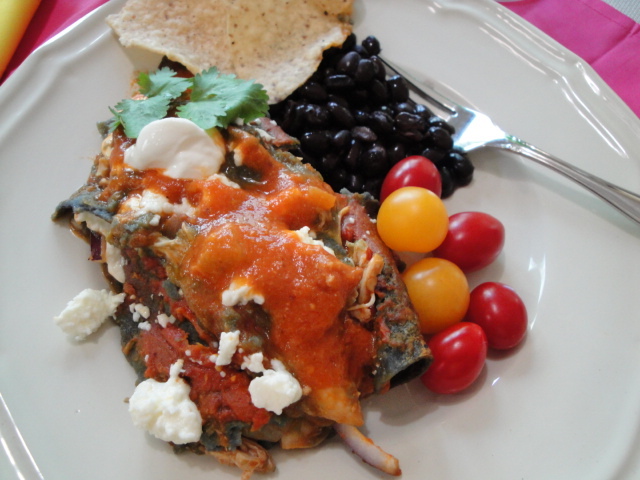 Even though I never made the Huevos Machaca from Mexican Cooking, I have made many of it’s recipes and this enchilada is likely the most repeated. It’s not quite as labor intensive as the Chicken Enclilada Verdes and is certainly a leaner, healthier dish. 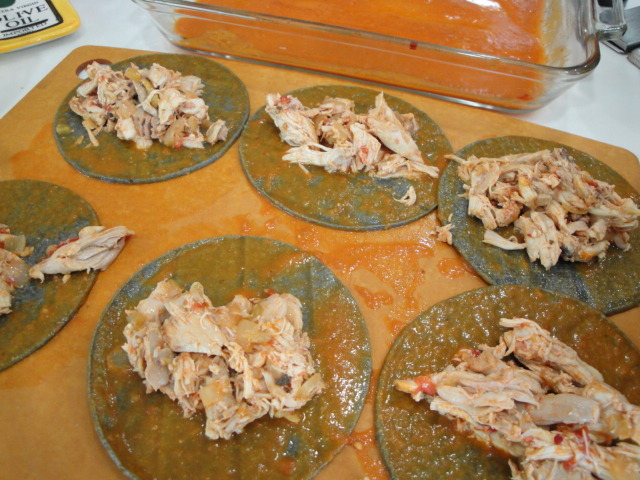 The ingredients are pretty basic-Chicken ,spices, onion & garlic, chilies, tomatoes, tortillas and cheese. I love that this recipe starts with a whole chicken! 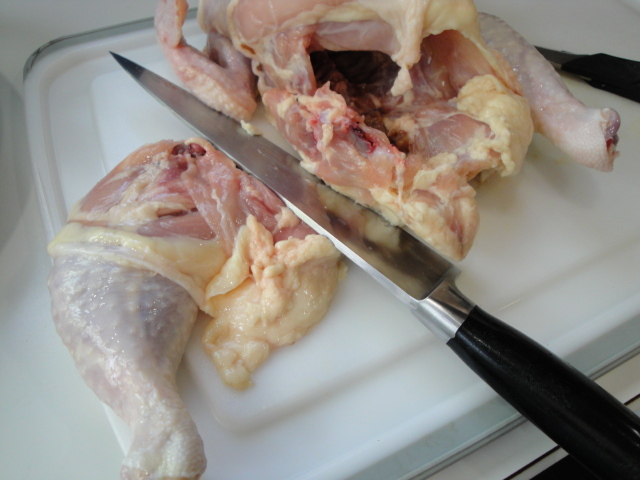 Of course you can start with pre-cut chicken parts (no boneless, skinless please) but a whole chicken is a good deal (often under $1.00/lb) and there is just something satisfying about mastering the art of cutting up the bird. 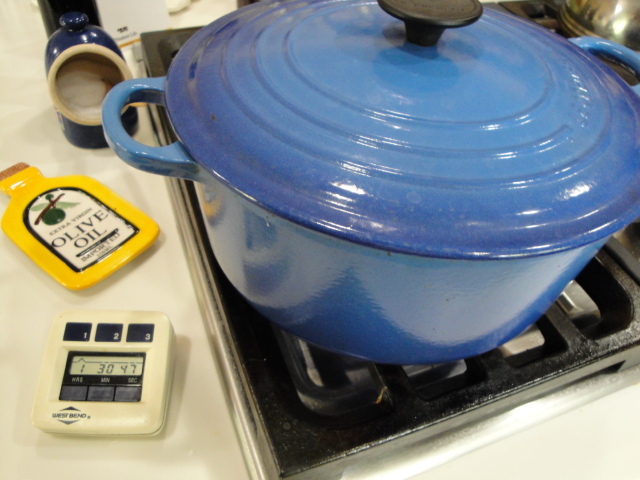 It doesn’t have to be pretty, you just need to get it into manageable pieces that will cook evenly. I like to use both a chef’s knife and a pair of kitchen shears on a cutting board with a trough to catch the juices. Position the bird with the tail toward you. 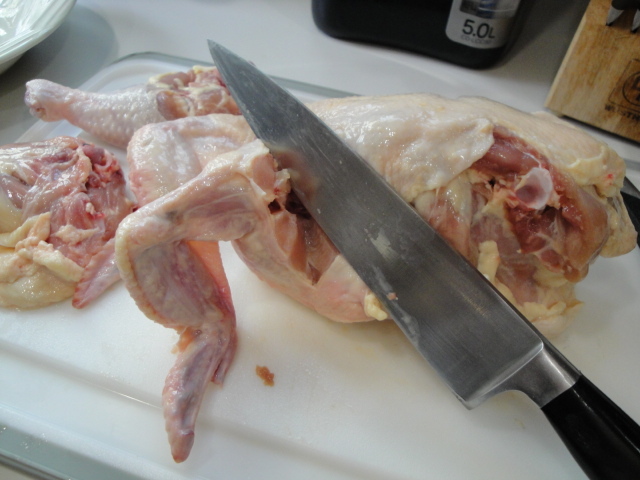 Pull the leg/thigh away from the body and slice through the skin and flesh until you get to the joint. You should be able to pop it and cut through the center of the joint with your knife or the shear. Repeat this same process with the wing. 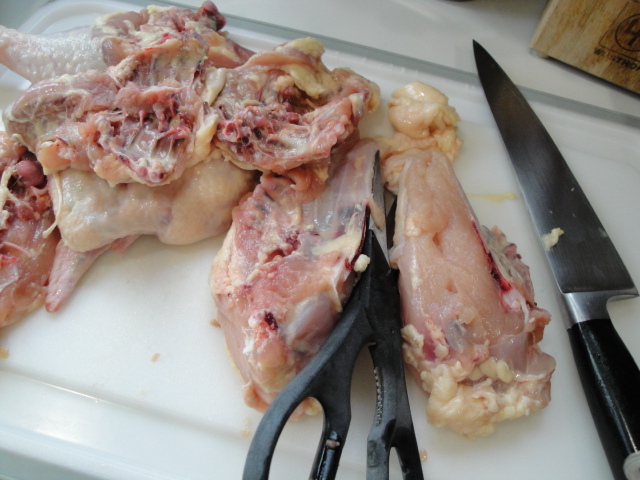 Turn the bird over on its breast and using shears, cut through the fine rib bones on both sides of the back. This will give you one long piece of mostly bones that will give your dish tons of flavor. You should be able to see the spot where you can cut it into two pieces. 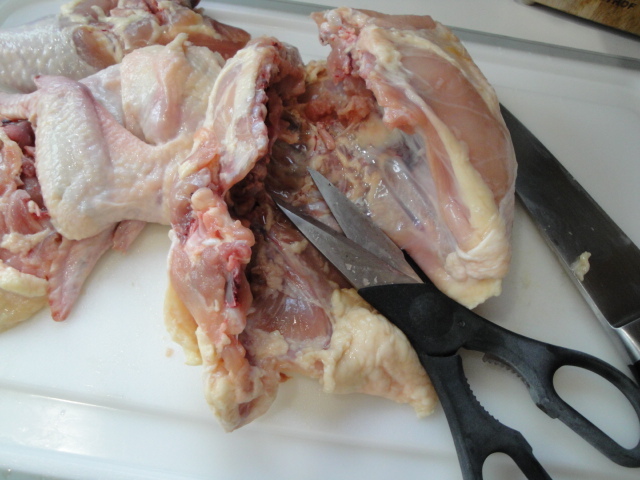 Then cut along the breast bone/cartilage to cut the breast into two pieces. Like I said, it doesn’t need to be pretty, it just needs to be cut so it can fit into your pot in one layer. Sprinkle it with salt, cumin, Mexican oregano and red pepper. 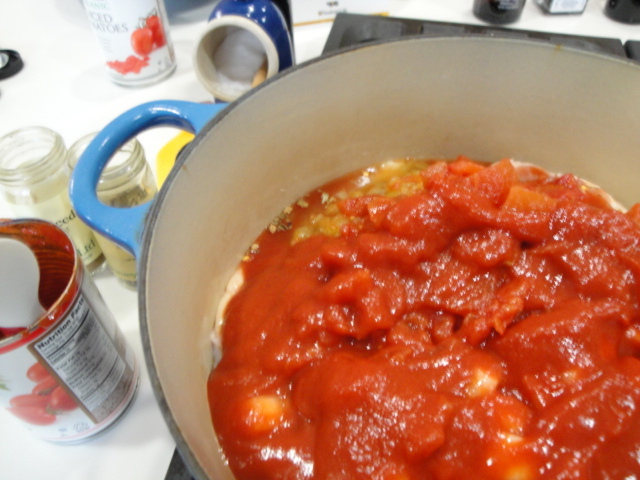 then the tomatoes and their liquid and the tomato sauce. 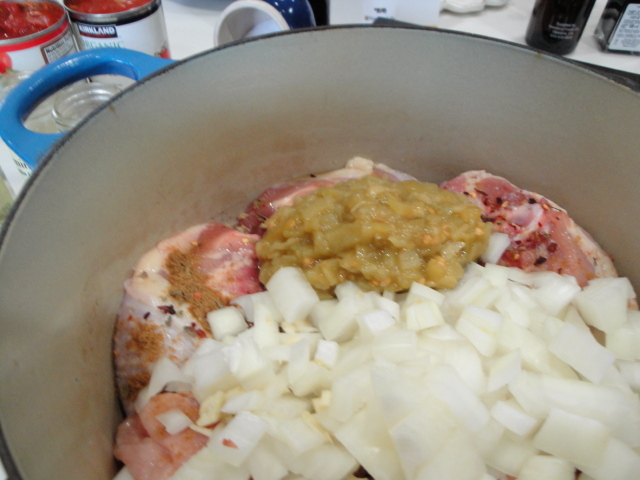 Bring to a boil, reduce to simmer, cover and cook for 1 1/2 hours or until the chicken is very tender. Using a slotted spoon, remove the chicken from the sauce. I put it into the dish I will use to bake the enchiladas. While the chicken is cooling, puree the cooking liquid into a smooth sauce with an immersion blender, food processor or blender. Be careful if you are transferring to a blender etc. and be especially careful if blending a hot liquid. I highly recommend investing in an immersion blender! 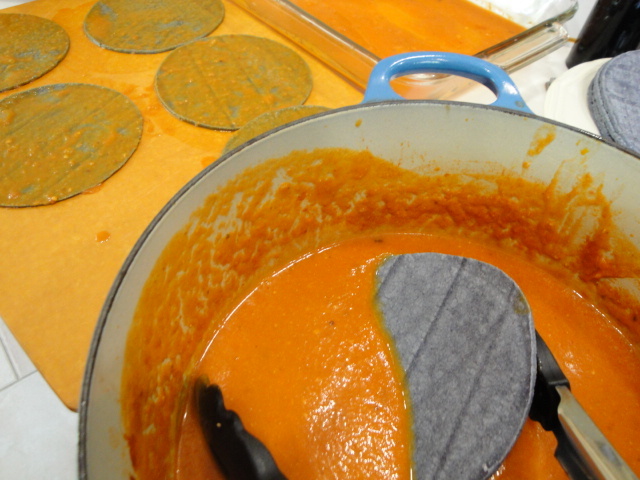 If the sauce seems very thin at this point, bring it back to a simmer and reduce to the consistency of tomato sauce. When the chicken is cool enough to handle, remove the skin and bones and shred into bite size pieces – you should have about 3 cups of chicken. 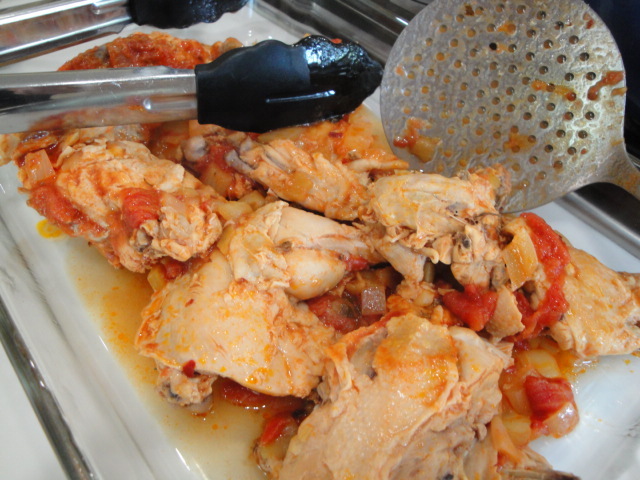 Add the tomato, onion and juice that was clinging to the chicken pieces to the bowl with the shredded chicken. Then stir in 1/2 cup of the blended sauce. Back to the baking dish that was holding your cooling chicken. Pour 1 cup of the remaining sauce into it and spread in an even layer. Today I’m using blue corn tortillas because they caught my eye when I was in the Mexican market, but any corn tortilla will do. If you can find some that are produced near you go for it, they will be much fresher. Instead of the traditional method of heating the tortillas in oil prior to filling, I give them a quick dip in the remaining simmering sauce. Dip them just long enough to make them soft and pliable. Alternative is to heat a stack of six for 30 seconds or so in a microwave. 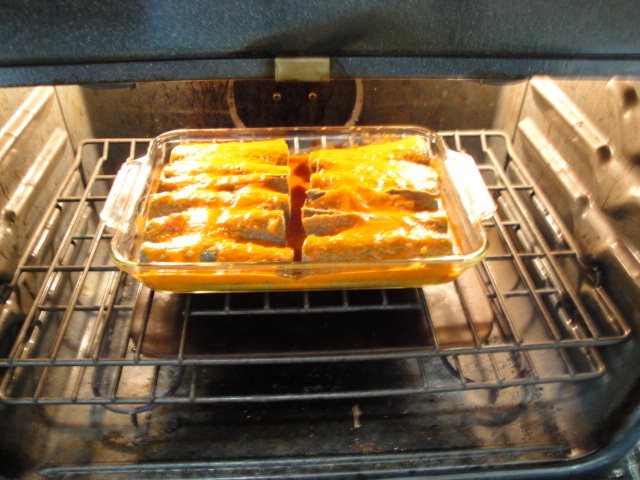 Roll or fold in half and place arrange on top of the sauce in the baking dish. Cover enchiladas with some of the remaining sauce. I like to keep a bit of extra sauce for serving. Bake, uncovered until bubbly and heated through, 20 to 25 minutes. A few chips, some black beans, fresh tomato, avocado, a dollop of sour cream and of course a margarita Yum!! And best of all I’ve got great leftovers for lunch or dinner tomorrow. 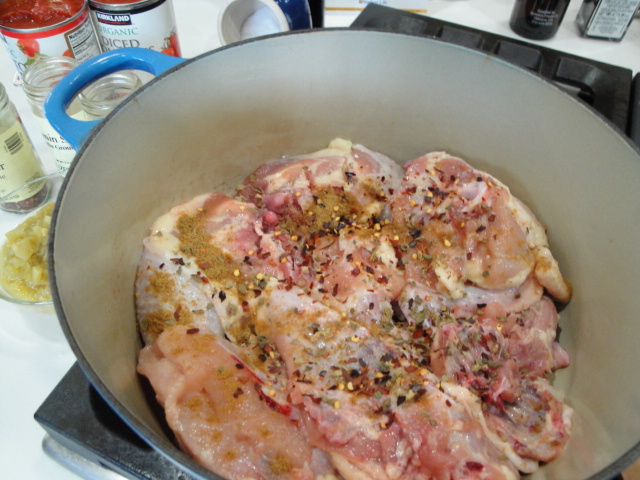 1 whole frying chicken, cut up or chicken parts 2 ½ to 3 lbs. 1 can tomato sauce the original recipe calls for an 8 oz. can, but I use a 15 oz. can because we like lots of sauce. When I can find it, I substitute a Mexican tomato sauce called El Pato. Arrange chicken pieces in a layer in a large skillet or Dutch oven. Sprinkle with salt, cumin, oregano, chopped onion, red pepper, garlic and green chilies. Pour on the tomatoes and their liquid and the tomato sauce. 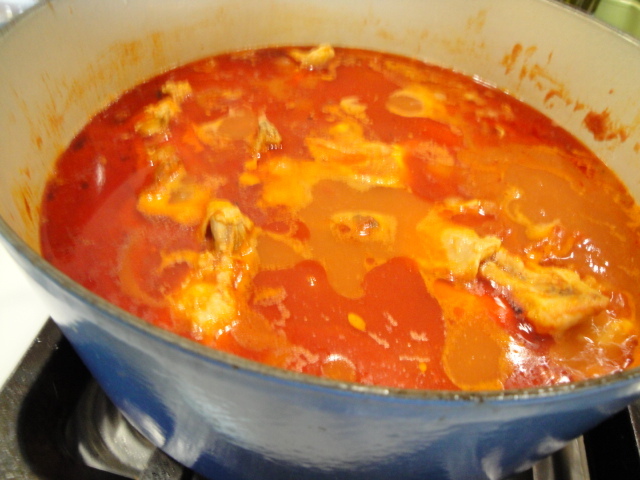 Bring to a boil, reduce heat, cover and simmer for 1 ½ hours or until the chicken is very tender. 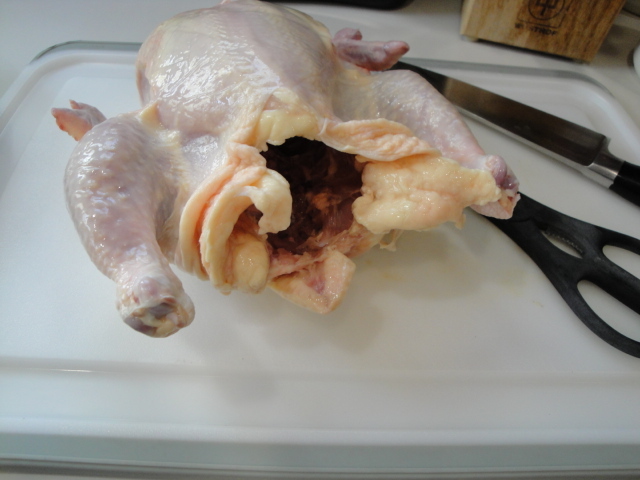 Using a slotted spoon, remove the chicken from the sauce. 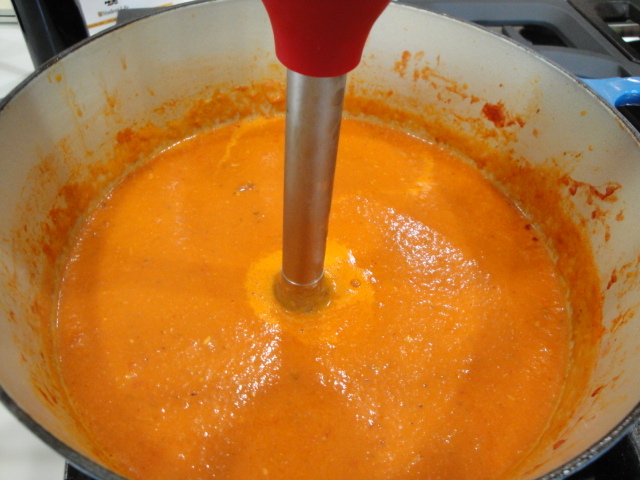 While the chicken is cooling, puree the cooking liquid and solids into a smooth sauce with an immersion blender or in a food processor or blender. No worries if you don’t have one of those power tools, a chunky sauce will taste mighty fine as well. When the chicken is cool enough to handle, remove the skin and bones and shred into bite sized pieces. You should have about 3 cups of chicken. 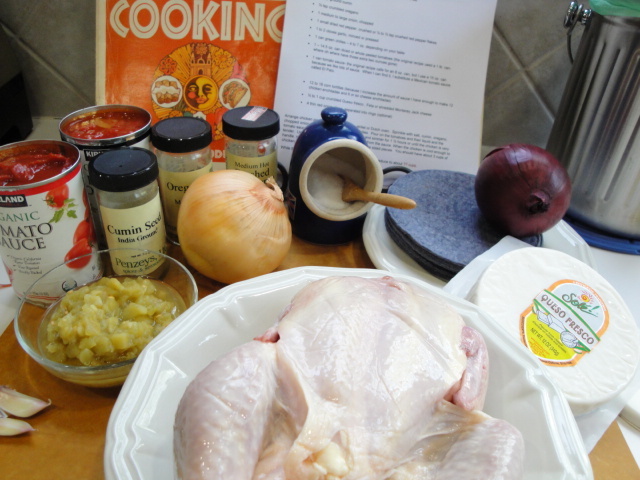 Add any of the tomato, onion and juice that was clinging to the chicken into the bowl with the shredded chicken. Mix ½ cup of the reduced sauce with the chicken. 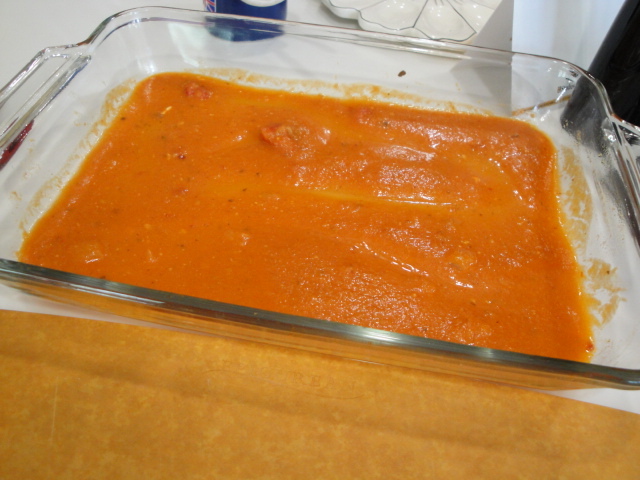 Pour 1 cup of the remaining sauce into an ungreased 9 x 13 inch baking dish. Dip the tortillas one at a time in the remaining hot sauce to soften slightly and fill each with approximately ¼ cup of the shredded chicken. 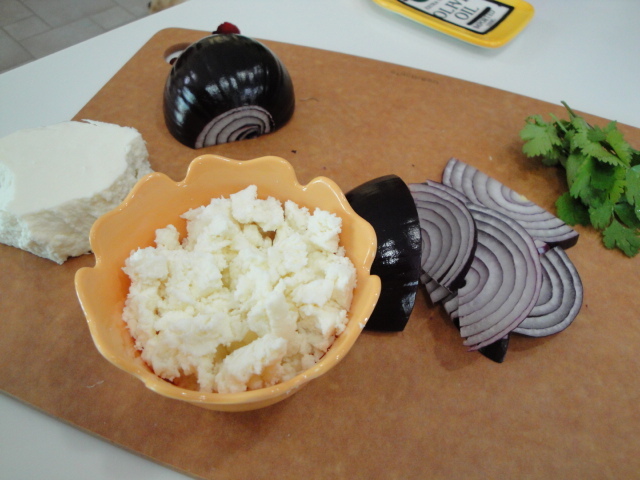 Roll or fold in half and arrange on top of the sauce in the baking dish. Cover enchiladas with some of the remaining sauce. I like to keep a bit of extra sauce for serving. Bake, uncovered until bubbly and heated through, 20 to 25 minutes. Sprinkle with cheese, red onion and cilantro. Serve with sour cream and avocado and extra sauce.